August has some fun events. As always information about FOLKMADS contra dances is posted at www.folkmads.org. It looks like dancing is back at the Heights Community Center in August, although I’m not sure about Labor Day Weekend. Judy Muldawer has posted some music jams and other events at Judy’s Music News. Albuquerque Concert, August 10: Kit French and I are co-hosting a concert featuring Jacqueline Schwab, who played piano on the soundtracks for Ken Burns’ Civil War and National Parks series and is also the pianist for the famous dance band Bare Necessities. The concert will be on Tuesday August 10, at 7 pm, at the First Unitarian Church, 3701 Carlisle Blvd. NE (corner of Comanche), Albuquerque, NM 87110. Concert tickets are $10 ($5 for students). Jacquie will be joined on a few songs by New Mexico’s own fabulous fiddler from Santa Fe, Karina Wilson. Here is part of the press release about the concert: Americana pianist Jacqueline Schwab will perform a solo soiree of her signature arrangements of vintage American music—reflective airs and rousing dance tunes that shaped American spirit—and traditional Celtic and English music.Jacqueline has been heard on the soundtracks to a dozen of Ken Burns’ documentaries, including his Grammy award-winning Civil War, his Emmy award-winning Baseball, The West, Lewis and Clark, Mark Twain, The War and his recently-premiered The National Parks: America’s Best Idea. In Burns’ words, “Jacqueline Schwab brings more feeling and intensity to music than anyone I know. Her playing is insistent, physical, heartfelt and … unusually moving.” Schwab’s improvisational playing draws on classical, traditional folk and contemporary roots. The New England Folk Almanac wrote she plays with “the jazz/classical improvisational spirit of Keith Jarrett and the touch of George Winston ….” For her Albuquerque concert, in this Mark Twain anniversary year, Jacqueline will feature music from Twain’s era (1835-1910) and beyond—Stephen Foster and Civil War song tunes, Victorian ballroom dance tunes, Scots and Irish songs and dance tunes brought over by settlers, hymns and spirituals, ragtime, plus 20th-century tango and Billie Holiday blues. She will also perform Scottish and English traditional music in the contemporary tradition. For more information, see www.Jacquelineschwab.com, or listen to sound clips on www.myspace.com/jacquelineschwab. Noralyn and I will be selling tickets at the door. So come on out, bring your friends, and please invite anyone who would enjoy attending this very reasonably priced evening of entertainment! Concerts Galore: www.ampconcerts.org/ is neal copperman’s awesome music venue with lots of concert information for music-lovers. Neal also organizes ¡Globalquerque!, which will be September 24 & 25, 2010 at the Hispanic Cultural Center, ABQ, NM (more on this below). 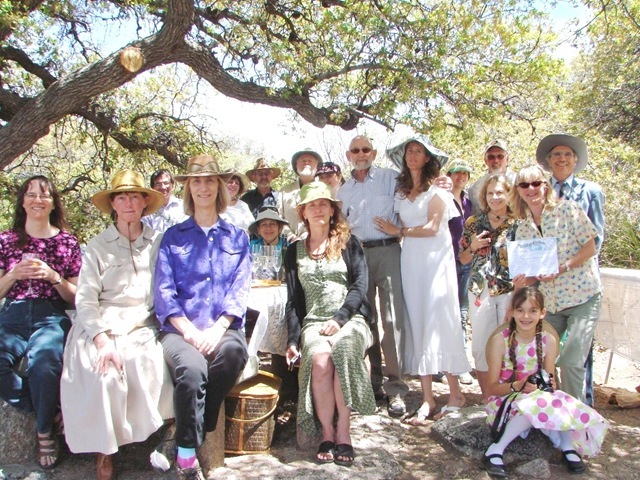 Folk Wedding # 15: On May 9, 2010 longtime dancer Joli Sharp married longtime wilderness activist Michael Soule in the Sandia Mountains. A tasty potluck followed. 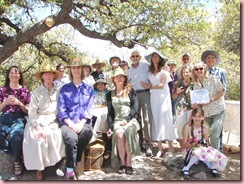 Here is the group shot of all present on that beautiful sunny day filled with friends, food, laughter and birdwatching. Tragic News: Those of you who attended Boo Camp 2004, 2009 Folkmadness in Socorro, any May Madness weekend in Prescott, or Dance in the Desert camp outside Tucson know the great dance band the Privy Tippers. On November 18, 2009 the Tippers’ guitarist Craig Tinney was in a motorcycle accident that left him quadriplegic. Despite a great attitude and rehab, he died on June 29, 2010. I blogged about Craig at http://merridancing.com/wp/2010/06/craig-tinney-departs-this-earthly-world/ Cherish our time on earth, since we don’t know how long we’ll be here. I shall add more events as I learn of them. Happy playing, dancing, and singing. Posted: 08|2|10 at 6:02 pm. Filed under: Monthly Folk eNews.